This rapier hilt was made to fulfill a promissory auctioned off to benefit the Kingdom Pavilion at the last Rapier Open. 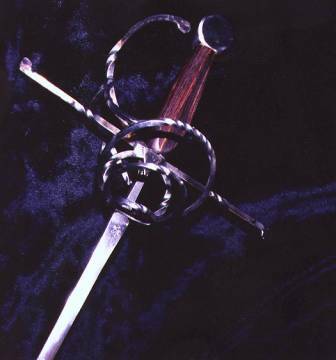 The primary purpose of the hilt was to survive the stress and strain of SCA Rapier combat. The desire was to create a hilt that would handle combat while still having a good period appearance. The three ring swept hilt pattern is found towards the very end of the SCA period. Plate 122 in Volume II of the Wallace Collection European Arms and Armour Catalog, shows three examples of Italian Swept hilts in a three ring pattern. A555 and A556 are both dated about 1590. The date for A557 is between 1570 and 1600. All of the hilts show the primary bars as three stepped rings. The outer ring is braced by a bar connected to the knuckle bow. Each hilt has three contra bars. Two bars are visible in the photo behind the blade. The third is hidden behind the outer ring of the primary bars. I was able to see these hilts in person during my visit to London several years ago. The Wallace collection is a wonderful resource for period arms and armor. This collection was deeded to the British people on the grounds that the collection stay static. As a result it is perhaps the best documented collection in the world. Baron Gwylym ab Owain and Don Giacomo Cavalli da Treviso have made a study of period rapiers. Based on their hands on research, which they conducted at Royal Armouries in Leeds, England, they were able to produce the following drawing. 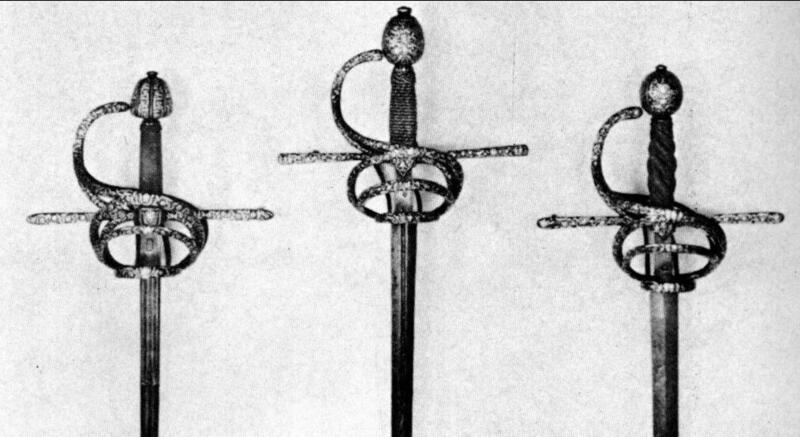 The drawing above illustrates a late 16th century Italian Rapier that Baron Gwylym and Don Giacomo were permitted to handle. The drawing is very useful in that the perspective is rotated slightly to allow us to see the curve of the third contra bar, which is hidden in my Wallace Collection photo. This curve mimics the upper half of the outer ring of the primary bars and the bracing bar that connects the outer ring to the knuckle bow. The rolled-over ends on the quillions and knuckle bow are found on a number of period hilts. By far the most common decorative detail was chisel work. I was unable to reproduce this level of detail, so I used twisted bars instead. Twisting the bars is a detail found primarily on earlier hilts. In period, the bars of the hilt would have been formed and welded at the forge. However, as I do not have a forge, I used a modern gas torch to achieve as period a looking result as possible. The bars were formed by spot heating and bending the steel over a form. The rolled over detail on the quillons and knuckle bow were made by spot heating the end, folding it over with a hammer and anvil and then welding the resulting seam. After the end was welded the final shape was created at the grinder. Once all the bars were shaped, assembly was performed using an Oxy-Acetylene torch. Some clean-up work was done after each weld to get to places that would be trapped by future welds. Once the welding was complete, the welds were reduced as much as possible by grinding. The hilt was polished using a combination of grinding, sanding, a wire wheel and a buffing wheel. All steps were performed using a bench grinder followed by a hand grinder to get at hard to reach locations. The hilt frame including the quillons is constructed of ¼” steel stock. SCA rules require a ¼” cross section on the end of any bars that might come in contact with the fighter or his opponent. The remaining bars are made from 3/16” steel to reduce weight. By: Sir James Mann, K.C.V.O., F.B.A., Hon. V-P.S.A.